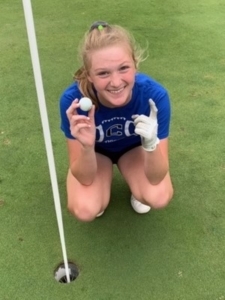 Hailey Bryant Hole in One…9/30/2018…Pretty Cool! Hailey Bryant, All Conference and All District Freshman girls golf team member from Carthage, made her first hole in one on Sunday September 30th. Hailey used a GW from 71 yards for the ace. The shot was witnessed by her dad, Chuck Bryant, Rylee Scott (All District sophomore girls golf team member) and Patrick Scott. Check out the video…Hailey’s first ace! https://www.carthagegolfcourse.com/wp-content/uploads/2018/10/Hailey-2.jpeg 522 391 Carthage Golf Course https://www.carthagegolfcourse.com/wp-content/uploads/2016/12/Carthage-Golf-Course-logo-300x162.png Carthage Golf Course2018-10-01 18:16:402018-10-01 18:16:40Hailey Bryant Hole in One...9/30/2018...Pretty Cool! Carthage Girls Win District at Home! CarBrook – Congratulations Carthage Men’s Golf Association!